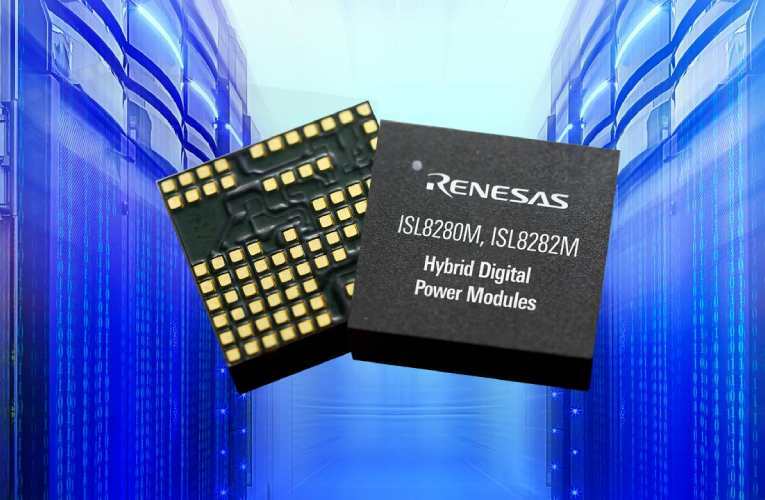 Renesas Electronics launched a pair of new encapsulated hybrid digital DC/DC PMBus power modules, the 10-amp ISL8280M and 15-amp ISL8282M offers best-in-class power density of 115mA/mm2 in a 12mm x 11mm package, with up to 95 percent peak efficiency and comes in Grid HDA Package. Along with this, Renesas also introduced the new ISL8210M and ISL8212M analog power modules, offered in the same pin-to-pin compatible 12mm x 11mm package with 10A and 15A of output current, respectively. ISL8280M and ISL8282M Hybrid Digital Power Modules Offer Highest Power Density and Efficiency for Advanced FPGAs, DSPs, ASICs, and Memory. The devices comes with a PWM controller, MOSFETs, and inductor inside a new thermally optimized, Grid High Density Array (GHDA) encapsulated module. The power supply made easy, so only input and output ceramic capacitors can be added to complete power supply. The Grid HDA package gives electrical and thermal performance through a single layer conductive package substrate that efficiently transfers heat from the module to the system board even under heavy load conditions. The new ISL8210M and ISL8212M are complete single-channel, synchronous step-down regulated power supplies that operate over a wide input voltage range of 5V to 16V. It comes with Comprehensive fault protection with voltage, temperature and current protections. The sample of the ISL828xM hybrid digital power modules and ISL821xM analog power modules are available now in 12mm x 11mm x 5.3mm Grid HAD Package from Renesas and its authorised distributors. The ISL8282M and ISL8280M costs $13.73 USD and $10.63 USD, respectively. Also the ISL8212M and ISL8210M costs $12.51 USD and $9.41 USD, respectively.